New research we have published today reveals that three-quarters (78%) of primary school children enjoy reading – the highest levels we have ever recorded. Our research also highlights the link between enjoyment of reading and attainment, with enjoyment of reading putting children over three years ahead in the classroom. The data shows that 10-year-olds who enjoy reading have a reading age 1.3 years higher than their peers who don’t enjoy reading, rising to 2.1 years for 12-year-olds and 3.3 years for 14-year-olds. 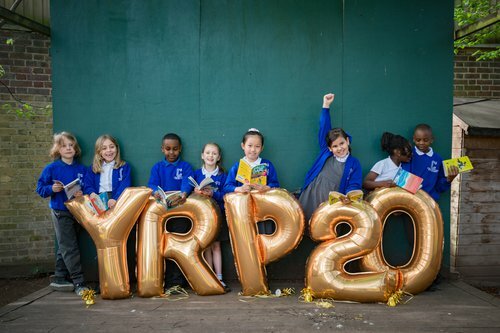 The research launch marks the 20th anniversary of our Young Readers Programme – the first-ever national school based reading for enjoyment initiative. With the support of funders including British Land, WHSmith Trust and plc, Rabobank, PwC and UBS, we have given more than 1.1 million books to 384,196 disadvantaged primary school children over the past two decades. For many, these were the first books the children had ever owned. 20 years after we launched our Young Readers Programme – the first national school based reading for enjoyment initiative of its kind – we are thrilled that our research has found children’s enjoyment of reading to be at an all-time high. When children enjoy reading and have books of their own, they do better at school and later in life, so we must continue to do everything we can to inspire children to fall in love with reading for a lifetime. To celebrate the Young Readers Programme, we have published a brand new book list: 20 Years of Children’s Choices. The list celebrates the most popular books chosen every year of the last two decades by the children who have taken part in the Young Readers Programme. The first year of the programme (1997) saw Harry Potter and the Philosopher’s Stone by J.K. Rowling top the children’s choices, with other popular titles for subsequent years including Jacqueline Wilson’s Sleepovers, Cressida Cowell’s How to Train Your Dragon, Jeff Kinney’s Diary of a Wimpy Kid: Do-It-Yourself Book and David Walliams’s The Boy in the Dress. Liz Pichon’s The Brilliant World of Tom Gates was chosen as the most inspirational children’s read of 2011. The award-winning author and illustrator has supported the Young Readers Programme for many years, delivering storytelling sessions in numerous primary schools. I have so enjoyed being part of such a great programme. We recently gave out free copies of my latest book, Family, Friends and Furry Creatures, to some of the schools taking part. It was wonderful to see all the kids’ enthusiasm for books. I honestly think I have the BEST job in the world, so finding out that The Brilliant World of Tom Gates was chosen by the children as a book that inspired them to read was just - BRILLIANT. I'm often contacted by parents who tell me how their kids were reluctant readers and how seeing them with their noses in a book – sometimes for the first time – makes them both happy. Helping children to find the books that they enjoy is so important, as reading should be a pleasure that will hopefully stay with them for life.